Cool on the new wedding band, and so many other things. I remember talking about that with you. At least no one will suggest a place where you can go to meet men while in Iowa, at least hopefully! ;). I did the meme. I changed a few questions because some of them aren't now and have never really been relevant. Happy New Year, friend! Nice job on the doll hair! 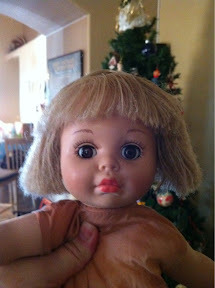 That's really amazing how well the doll's hair turned out.... 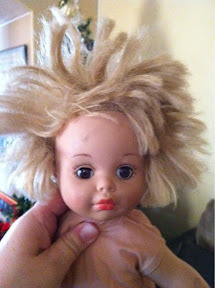 I am *almost* motivated to try this on a couple of our "rock star" dolls [ I love that LOL! ].